Ties between South Korea and Rwanda are really good. In deed, Korea Telecom has announced that they have signed a deal with the Governement Of Rwanda, with the aim to build the 4G LTE Technology in Rwanda. Rwanda which wants to become an Information and Communication Technology hub in Africa, has developped various partnership with both South Koreans firms and universties. Government, through the Rwanda Development Board (RDB), and Korea Telecom (KT) yesterday signed a memorandum of understanding to establish a public-private partnership in the form of a Joint Venture Company to deploy high-speed broadband services based on 4G LTE technology – the first-ever of its kind in Rwanda. The joint venture is intended to develop, construct, operate and provide wholesale infrastructure services to customer-facing mobile service providers and mobile virtual network operators in Rwanda. The Korean firm targets to enhance nationwide broadband services by providing the required ICT infrastructure and skills. 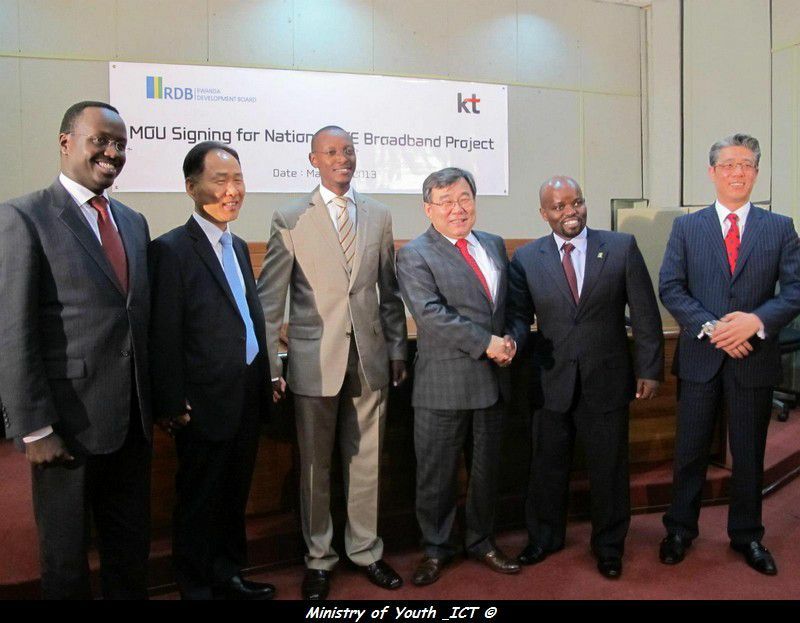 RDB’s head of ICT, Patrick Nyirishema, said Rwanda had been working together with the Korean firm for the last six years in the deployment of Rwanda’s extensive fiber optic network and the early form of high speed mobile broad band services. “We now intend to extend this important relationship by working together to bring the most advanced form of broadband connectivity to Rwanda and to share our success with other African countries,” Nyirishema said. “After the required infrastructure is set up, we shall be happy to see more educational services and health services, among many others, rolled out to Rwandans, especially to those in rural areas much more affordable,” said Hong-Jin Kim, president of KT’s Global and Enterprise Business Group. The KT Corporation (KT) was established on December 10, 1981. On December 11, 2001, KT Corporation transformed its corporate identity into 'KT'. Shortly thereafter, in May 2002, the company was completely privatized. KT is the short form for Korea Telecom. Today, KT is a leading telecommunications and Internet company in South Korea.